This is me! This is what I do! Hear me roar… umm… or please see my Case Studies page. Are you wanting to shout your services and great work to the world? Want to advertise without actually advertising? But what you do is SO fantastic how will prospective clients ever believe that you can achieve what you are shouting about? Proof? you want proof? I’ll show you proof! 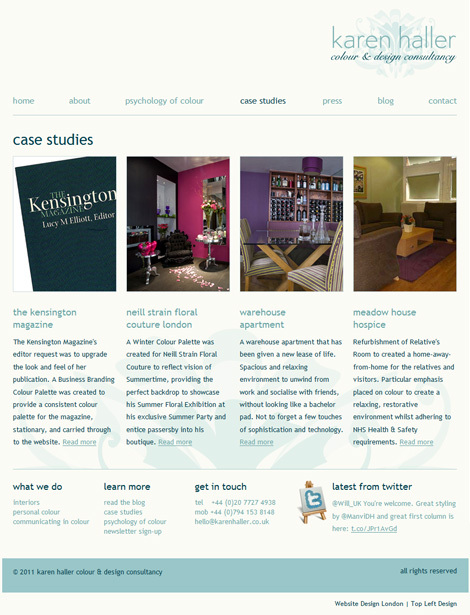 Before you can have the perfect case studies page you need a few perfect case studies. Here are some tips on how to create a perfect case study. Images – images always make things more interesting, if you haven’t helped a client with anything tangible that you can include photos or screenshots of, then you can use stock images, just make sure they are well chosen, match the look and feel of the rest of your site and they aren’t cheesy! Testimonials – these are the life of case studies. Testimonials give a name and occasionally a face to the case study – this helps people feel a connection to the client in question and can build trust. If you can convince the testimonial giver to let you use a picture of them, then that’s even better. Give me more! – if you have chosen to take our advice and have an intro to begin with be sure your site visitors can find the entire case study easily by either including a link to the full case study or a link to a downloadable PDF of the case study (something that visitors can download and read at their leisure). By showcasing a variety of different types of clients, you have a greater chance of the reader identifying with ONE of them and understanding how you can help THEM. 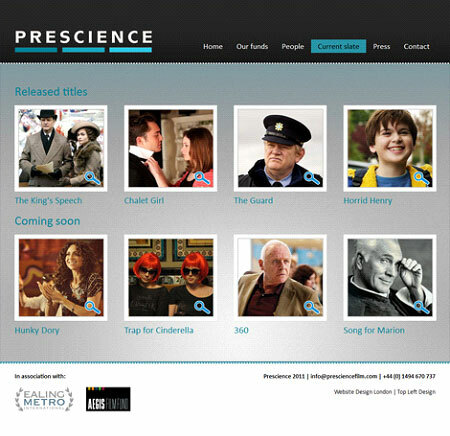 Prescience is an integrated media company who focus on film production, financing and sales. They have helped fund movies such as ‘The Kings Speech’, ‘Chalet Girl’ and ‘Horrid Henry’. Their case studies page needed to show all the projects they have helped fund, the projects that are soon to be released and even ones still in development. 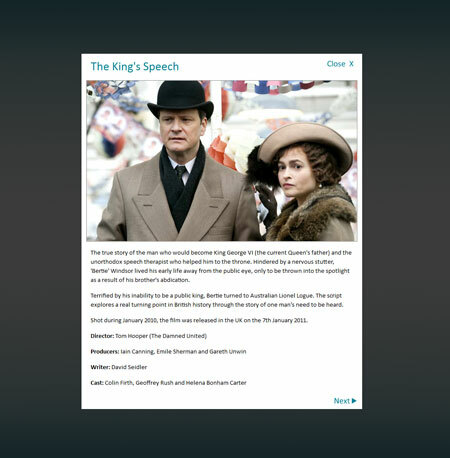 Their main case studies page just features the movies name and a recognisable image of the actors in the films, if you click on any of the movie names or the magnifying glasses a cool lightbox pops-up to give you an overview of the movie, from there you can navigate through them all. Being a colour and design consultancy means that there will always be lovely pictures to feature on the case studies page. The main case studies page features 4 case studies – large images, intro, and a link to the full case study. Each case study has its own page which features a full breakdown of the projects (using those fabulous headings), a testimonial from the client, clever links leading into other parts of the website and a lovely gallery to showcase the colour and design consultancy that was supplied. 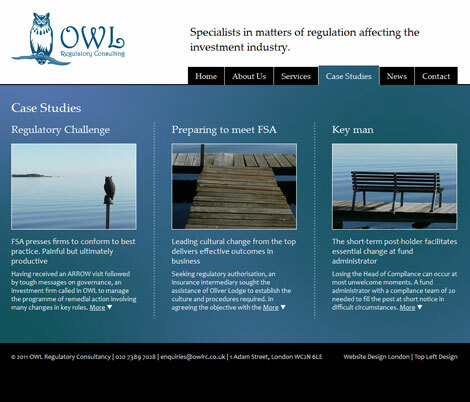 OWL is a Regulatory Consultancy who have helped many clients. They chose only 3 case studies to feature on their website. It’s a very simple layout and the full case studies all appear on one page. Based on the fact that the case studies are quite small we used a great drop-down feature. So arriving at the page you see the 3 case studies, headings and images, and if you click on the ‘More’ link then it drops down to show the whole case study. My podcast interview with Jörgen from Link Humans – a guide to effective websites! Amy has been with Top Left Design since December 2007. She has a degree in Graphic Design from TUT in South Africa. Amy works on design, content entry and formatting, keeping our clients’ websites up to date and generally being efficient! She now does this from sunny South Africa, as she has relocated there – but still works just as hard for us and our clients.